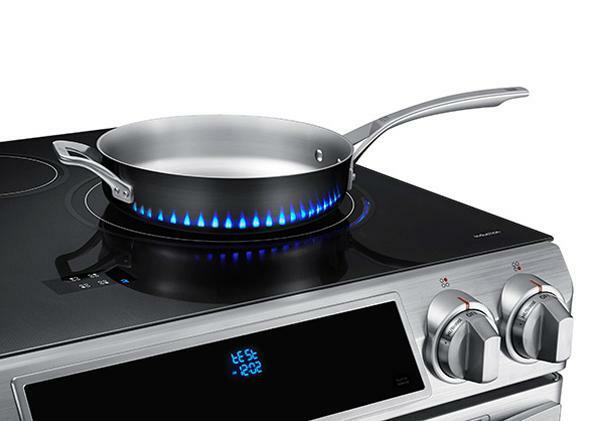 Samsung's Virtual Flame Technology uses blue LEDs to show heat on induction stoves. Virtual Flame Technology at work. Induction stovetops, which use changing magnetic fields to generate heat from a pot or pan’s electrical resistance, sort of seem like magic. And Samsung is clearly worried that the technology is coming across as more fantastical than usable. So in its high-end Induction Chef Collection Range, the company is adding blue LED flame projections to lend a more tangible cooking experience. The blue LEDs are tuned for brightness, so the brighter they are the hotter the burner setting. Induction stoves are known for providing amazingly consistent heat and quantified granular temperature controls (as opposed to, say, a gas range where you have to eyeball everything), but that can also be a disadvantage for people who want to cook by feel. By linking the brightness intensity with the heat being put out, Samsung could be making the cooking experience a little more accessible for people who are unfamiliar with induction or are just distracted while they’re cooking and looking for a quick indicator. It might not be as satisfying as the classic look and feel of an open flame, but it’s a cool (get it??) innovation in an underappreciated cooking technology.